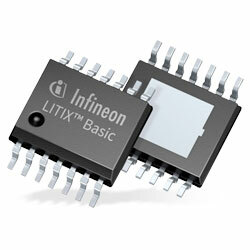 Infineon Technologies LITIX Basic+ LED Drivers, available now from Mouser, are a scalable family of LED Drivers featuring one to three inputs/outputs and an integrated power shift circuit. Output currents from 5mA up to 360mA (with power shift) can be served with these LED drivers. The devices also have optimised diagnosis features as well as an enhanced output current accuracy. Several selectable fault management modes offer high design-in flexibility. Also, the drivers flexible Single LED Short (SLS) feature allow these devices to go into a latched off-state, an active retry state, or a diagnosis state without channel deactivation. The driver family assists design flexibility by footprint compatibility. All devices in the series are provided in pin compatible PG-TSDSO-14 packages, with a wide -40C to +150C operating temperature range, are Pb-free, and RoHS compliant. Typical applications include turn indicators; Position, fog, rear lights, and side markers; Animated light functions like wiping indicators; Day running lights; Ambient lighting; and also LED indicators (industrial and instrumentation).